The bald eagle, a traditional American image, is showcased on this original ink and watercolor fraktur. 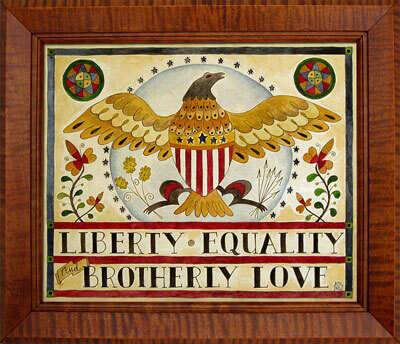 This one-of-a-kind piece evokes a feeling of patriotism that represents our cherished American ideals. As always, the words from this fraktur were "borrowed" from an 18th century fraktur drawing found in a vintage book featuring American images and symbols. Handmade tiger maple frame. Acid–free framing materials are used in the finishing process.